Mangaluru, Nov 29, 2015: Indian Coast Guard base here, on Nov 26, Thursday successfully conducted a medical evacuation on a Montenegro national, who is the master of merchant vessel MV RHL Constantia. The evacuation took place off Mangaluru. Borivoje Millinovic (61), suffered from high blood pressure and a suspected heart attack. MV RHL Constantia (Flag- Malta) sent a mail to Indian Coast Guard Maritime Rescue Coordination Center (MRCC), Mumbai on Nov 26 at around 2.30 pm regarding the emergency. The vessel was on its way from Pipavav in Gujarat to Port Tanjung, Malaysia. MRCC Mumbai immediately directed Maritime Rescue Coordination Sub Center (MRSC) Mangaluru at No 3 Coast Guard District Karnataka to help with the evacuation and at the same time, the agent of merchant vessel, M/s. James Mackintosh and Co. Pvt. Ltd at New Mangaluru was also informed about the evacuation. MRSC Mangalore succeeded in communicating with MV RHL Constantia and the District Medical Officer of Coast Guard provided immediate treatment advice for the patient via VHF radio. 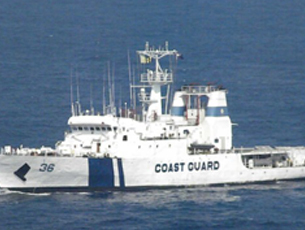 Indian Coast Guard Ship Amartya was also diverted for assistance. In a combined effort the officials succeeded in evacuating the patient and admitted him to AJ Hospital, where his condition is said to be stable.